When you look at some of the most attractive lawns grown from sod in Phoenix, you will notice that homeowners choose Bermudagrass more than other species. Bermudagrass hybrids offer a range of options with respect to color, texture and their ability to tolerate drought. A variety such as Midiron has a medium-course texture with a blue-green appearance and good drought tolerance. Celebration Bermudagrass is more tolerant of drought while Tifgreen 328 produces a lawn with a bright-green color and well-manicured look. You can create the best conditions for your Arizona sod by watering it properly. The frequency, duration and time of day of your watering sessions is important but you can construct a suitable schedule with ease. For the first two weeks after you install your new sod, you should water it four to eight times per day in short intervals of five to ten minutes to keep the sod evenly moist. During the third week, water once per day for 15 to 45 minutes, to help train your roots to reach deeper into the soil for water. Sod in Phoenix generally needs about three weeks to establish itself, after which you can settle into a normal watering pattern. Water an established lawn two to three times per week for ten to 25 minutes. Try to water early in the morning or in the evening. During the hottest part of the day, the soil will not have enough time to absorb the water before the sun or the heat causes it to evaporate. Living in a desert community means that you have to think a little creatively about your water sources. Rainwater and recycled household water can supplement your traditional water supply to provide all the water your landscaping needs. Use rain barrels to collect rainwater from your roofs and gutters. A brief shower that yields about ½ inch of rain can fill a 50 to 55 gallon barrel when you position it to collect the runoff from a 2,000 square foot roof. 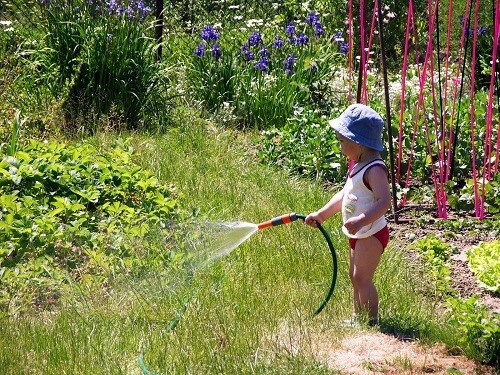 You can use the water directly on your lawn or as part of your comprehensive watering scheme. Gray water is the water that you used in your home from your clothes washer, bathtub, shower or bathroom sink. While it is usually safe to use gray water on your Phoenix sod, it may be easier to use it on shrubs and trees. Arizona regulations do not allow you to use a sprayer to distribute gray water. Sprinklers and timers can help make watering sod in Arizona more efficient. Timers allow you to water your lawn, even if you are not home. Timers are particularly helpful during the first three weeks of your new Arizona sod. Install an in-ground sprinkler system or use portable sprinklers. Whichever system you choose, take care to position the water spray so that you minimize the amount of water that runs down a slope and off the lawn. If you keep the water low to the ground, you reduce slightly the amount of loss due to evaporation.